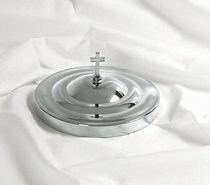 We are pleased to present RemembranceWare for your church communion needs.Traditional silver colored communion serving products in the RemembranceWare line make a true statement with top of the line food-grade stainless steel construction, remarkable shine, easy maintenance, and great prices. This stainless steel cover covers the bread and fits both the breadand the stacking bread plate. It is topped with a simple, but elegant, Latin cross finial which is attached with a stainless steel screw. About "Communion Bread Plate Cover Silver"